Not so long ago, George and Harold created the greatest superhero in the history of their school – and brought him to life by mistake! He is Captain Underpants, and his true identity is so secret that even HE doesn’t know who he is! But that was only the start… Now the boys have accidentally created a whole army of evil, vicious talking toilets intent on taking over the world!!! Someone needs to flush them out – and it’s DEFINITELY a job for the world’s ONLY superhero with WEDGIE POWER! It was nice, a bit gross but at the same time funny. I liked it when Fred and George changed come and see our lovely armchairs into come and see our hairy armpits! It’s hillarios! I’ve got the collectors edition with a cd and on it is the song oops I farted! This is an amazing book to read. It is a hilarious novel. 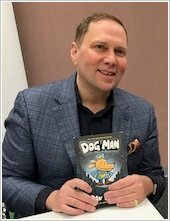 I would recommend this book to children aged 7-11 years old. Oh it was a great book it’s funny too!!!! I’ve read two captain underpants books and this one is the best. I’m getting one for my Birthday. You should get this book and read it it’s great!!! really funny and it made me laugh! 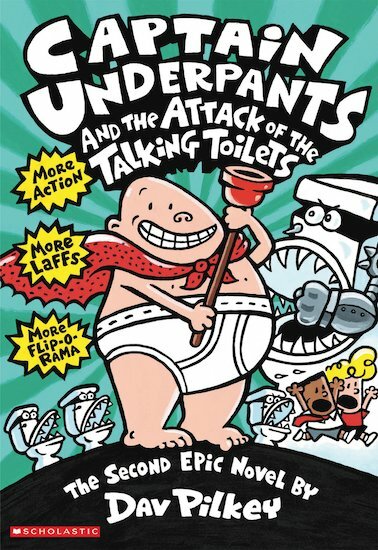 Captain Underpants and the Attack of the Talking Toilets is a fun quick read book about george and harold who make an army of Talking Toilets. If you want a quick read then this is the book for you just don’t expect it to be the next harry potter. Flip-o-Rama! Awesome! Hypnotized principal in his underpants and a curtain under the control of two bored kids!Wicked! What can possibly go wrong!? I picked the book up out of the liabary not knowing whether to have it or not. I had it and read it. I propably read it altogether in 1 hours 15 minutes and I LOVED it!!!!!!!!! Its alright. the only captian underpants book I have read. And its alright! This book is totally rubbish! There is absolutely no plot – rubbish! This is the only Captain Underpant’s Book which I have read because it was so pathetic. If I clicked ‘rubbish’, I would be being too generous! I think George and Harold have gne way too far, First they found him fighting robbers and now attacking talking toilets!! The Turbo-Toilet 2000 wants to destroy C.U Forever! THIS BOOK WAS GREAT IT WAS ALSO VERY FUNNY. I have read this book and I would give it two thumbs up. It has comic fantasy and lots of wedgie power. Well as you know the cover of the book tells you everything as you can say this books is pants and it has pants, well its not its quite intresting as Captain UnderPants has adventures with his pants but this time talking toilets attack him Cpt. Underpants, so he has to run as the toilets are on attack maybe it wasnt good for him to wear pants after all! this book is very funny and is great for both boys and girls! it is a great story a, george and harold are very fuuny but i’m not too sure in that head teacher his a meany!!!!! !